Your browser does not support HTML5 video. Please upgrade to a newer version. 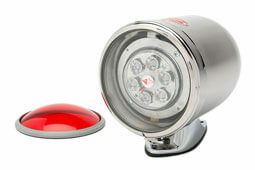 The Tri Lite Mars "888" Traffic Breaker is one of the most distinctive warning lights available for use on emergency vehicles. The pedestal mounted light is in a corrosion resistant, polished, stainless steel housing that demands attention! Highly Polished Stainless Steel Housing. Choice of Red or Clear Lens. Available for use with 12 or 24 Volts. 8 3/4" high, 10 3/4" diameter, 11" long. See Mars "888" Traffic Breaker in action!